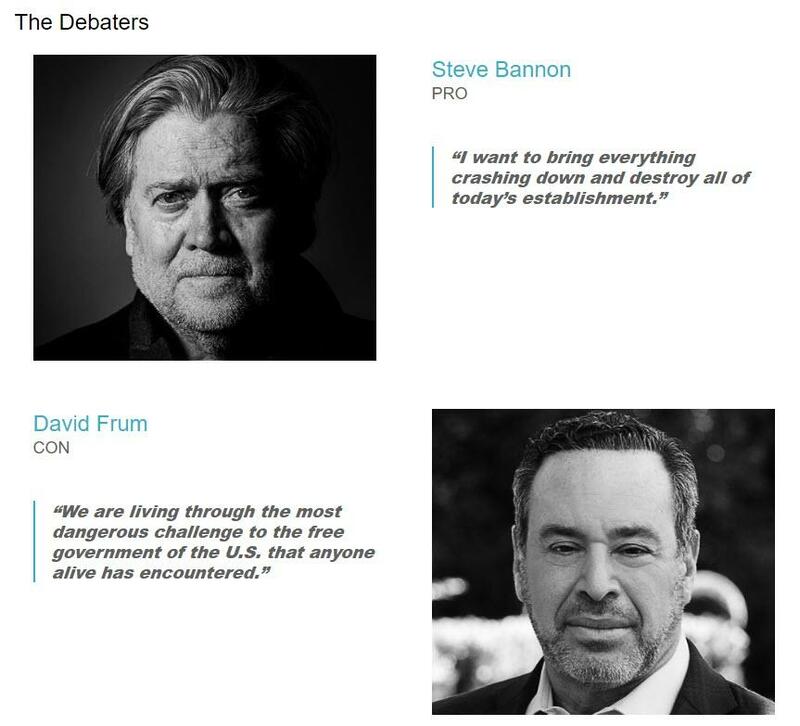 Tonight's edition of the Munk Debates promises to be a provocative, and potentially "explosive" confrontation between two polar opposites - Steve Bannon on one side and David Frum on the other - discussing the future of democracy and the rise of populism. Arguing the opposing side will be Canadian-American David Frum, Senior Editor at The Atlantic, former speechwriter for President George W. Bush and author of the recent book Trumpocracy: The Corruption of the American Public. It promises to be an exciting debate, especially since as Canadian Press reports, chanting protesters successfully delayed the start of the debate. Police intervened outside the downtown venue with batons and reportedly made several arrests. Debate organizers explained the delay by saying they anticipated protests and want to ensure everyone is safe. Critics, who accuse Bannon of being a white supremacist, wanted the debate scrapped. Protesters, some holding signs deploring racism, yelled "Shame on you!" and "Nazi!" as people tried to get in, reducing one woman on her way into the debate to tears. "We are going to work diligently as a group to make sure this is a safe evening," said Rudyard Griffiths, the chairman and moderator of the debate. "That is going to require us to wait a little bit." The debate is slated to play out just ahead of the fiercely contested US midterm elections on Nov. 6. Organizers said about 2,700 people paid to attend, while about 2,000 others were expected to watch via livestream.